Buckle up, gentle reader, tonight's #a2council meeting promises to be a spicy one. Here's the agenda. The evening kicks off with a 16 item Consent Agenda. Highlights therein include 4 street closures for festivals as well as a Greenbelt purchase. In the past Greenbelt purchases have been pretty routine, but recently they have been somewhat more controversial. I would not be surprised if this item gets pulled from the consent agenda. There are 4 public hearings on tonight's agenda. 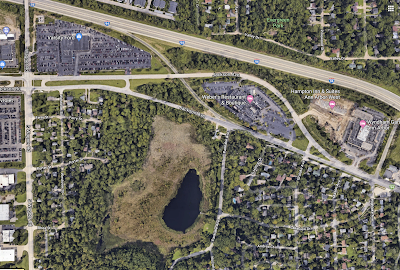 PH-1 and PH-2 deal with the Mallets Wood PUD which would rezone 3.77 acres at 3300 Cardinal Ave. from single family residential to Planned Unit Development (PUD). PH-3 is a township island annexation. I have not been following either of these proposals very diligently. I know there has been some recent opposition to annexation by people who live in township islands. Still I wouldn't be surprised if there are not a ton of speakers during these public hearings. PH-4 is tonight's spiciest chili. This public hearing is for the Lockwood of Ann Arbor PUD. This project is located at 3365 Jackson Road. It would rezone 3.52 acres from single family residential to PUD in order to build a 95 unit senior independent living facility. 40% of the units would be affordable units for a period of 99 years. Supporters and detractors of this rezoning are expected to turn out lots of folks for this public hearing so make sure you have your popcorn ready. I expect this will be a long public hearing and that council's discussion of the ordinance (C-2) will also be pretty long and heated. There are a couple of other interesting items on the agenda tonight. C-2 and C-3 are downzonings, which we haven't seen come before council in a long time. C-2 rezones 0.6 acres from C2B (Business Service District) to R2A (Two-Family Dwelling District) in the 600 block of South Ashley. Planning commission has unanimously recommended denial of this ordinance. C-3 rezones 58 lots from R4C (Multiple-Family Dwelling District) to R1D (Single Family Dwelling District) and 4 Lots from R4C (Multiple-Family Dwelling District) to R1E (Single Family Dwelling District) in the West Hoover/West Davis area. Planning Commission recommended denial of this rezoning 5 to 3. It will be interesting to see how the council factions debate these downzonings. Elsewhere in the agenda, CM Ackerman is introducing 3 resolutions aimed at provisioning affordable housing: DC-4, DC-5, and DC-6. There is also a resolution to study the regulation of short-term rentals: DC-7. Gentle reader, what are you most looking forward to at tonight's #a2council meeting? Make sure you tune in tonight at 7 to watch CTN's live stream and follow the blow-by-blow action on #a2council hashtag on Twitter. There is Dioxane in the tap water, and council business is focused on street parties?